YANGON (5 April 2013) – If philanthropy in Myanmar has a name, it has to be U Zaw Zaw. 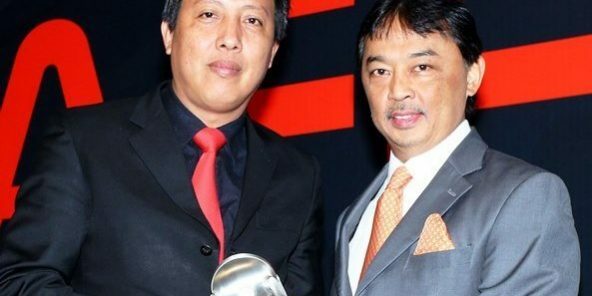 After taking over the reins of the Myanmar Football Federation (MFF) in 2005, Zaw Zaw has reinvented football in Myanmar where the successes of the last couple of years has led the federation to pick up the AFF Association of the Year award at the AFF Awards 2013 on the weekend. And the accolade could not have come at a more opportune time for the economically-changing nation of 50 millions as they look forward to hosting the biennial SEA Games at the end of the year. The last time Myanmar hosted the SEA Games was back in 1969. “I’m aiming for success not only for Myanmar but also for the region, in ASEAN and Asia. Youth development is important as they are after all our future,” said the 46-year-old entrepreneur who is one of the most wealthiest man in Myanmar. “Development programmes are the most difficult in the world as most of the time, everyone are just looking for instant success. Myanmar are the only Member Association in the region who have consistently hosted youth events over the last several years – at both the AFF and also Asian Football Confederation (AFC) level – from the Under-16 to the Under-19. They organised the qualifying round of the AFF Suzuki Cup in 2012 where they emerged winners in the competition that was played in Yangon against Timor Leste, Cambodia, Laos and Brunei Darussalam. The MFF also organised Group G of the AFC Under-22 qualifiers last year against South Korea, Malaysia, Vietnam, Chinese Taipei and the Philippines. Myanmar made the cut for the tournament proper in 2014 as the second best team from the group. The AFC U22 qualifiers also recorded the highest attendance in a qualifying competition with 28,000 spectators turning up for the Myanmar-Malaysia clash while 20,000 came for the South Korea-Myanmar tie. And just last month, the MFF organised Group E of the qualifying round of the AFC Challenge Cup 2014 against India, Guam and Chinese Taipei. They won the ticket to the final round of the competition that will be hosted by Maldives. “These successes showed that we are doing things right but it is still not enough. We have a lot more to do for sure,” quipped Zaw Zaw, who has now been tasked with branding and sponsorships for AFF youth tournaments. “We have just started programmes in the primary school with the MFF U12 tournaments which is school based. We have to work with the sponsors to make sure that the competition, grassroots and also infrastructures are well implemented. Among those were the AFC ‘A’ Licence Coaching, the AFC Futsal Level 1 Course, the AFC Goalkeeper Level 1 course and also Grassroots clinic with John Barnes and Real Madrid. Zaw Zaw said that while some of the expenses are through grants from the AFC and also FIFA, it is not enough. He said that alongside expenses for the FA, coaching staff, the different level national teams and also various other commitments to football and regional secretariats, he has had to come up with money from his own pocket. Zaw Zaw spent some USD 2 million each month through additional fundings from personal as well as friends who are club owners of the Myanmar National League (MNL) which was launched in 2009. “But all these effort would not have been possible without the support of the Myanmar fans. They have been simply fabulous in the chase for success of the Myanmar national team,” he quipped. Zaw Zaw said that after the successes of the men’s team, the federation is now working towards the inaugural AFC U14 qualifiers and also the qualification of the Women’s Football team for the FIFA Women’s World Cup in 2015. There is every opportunity for Myanmar to make the cut following the ban on DPR Korea which meant that they will realistically be up against Thailand and Vietnam for the one available spot from the AFC Women’s Championship next year. The team under Kumada Yoshinori, who picked up the AFF Best Coach (Women) at the AFF Awards 2013, will be sent to Japan for exposure. “We had just formed a Women’s Committee two months ago and we will begin the Women’s League with eight clubs taking part later this year,” he added.